The 2017 Breckenridge Dew Tour is here and so are the Olympians! Twenty-four medalists from the 2014 Sochi Olympics will take part in the Winter Dew Tour at Breckenridge Ski Resort from December 14th to the 17th. The event this year also doubles as a 2018 Pyeongchang Winter Olympics qualifier for the United States and Canada. The competitions this year at the Breckenridge Dew Tour consist of halfpipe and slopestyle snowboarding and skiing for men and women. It also serves as a U.S. Ski & Snowboard Olympic qualifying event. During this event, Canadian men and women’s snowboard slopestyle teams will be selected. This will be para snowboarding’s second year at Dew Tour. It will serve as a World Para NorAm competition for the first time. A new para discipline that will make its Olympic debut this year is the banked slalom. It will take place on Friday, December 15th. The U.S. team that swept the Para-Snowboardcross podium in Sochi in 2014 — Evan Strong, Keith Gabel and Mike Shea — are all scheduled to compete. Also competing is Sochi women’s Para Snowboardcross bronze medalist Amy Purdy of the U.S.
Purdy played an integral role last year in connecting the dots between her non-profit, Adaptive Action Sports (AAS), Toyota and Dew Tour to bring the event to life and as presented by Toyota. The streetstyle competition during the Breckenridge Dew Tour is certainly a crowd favorite. This open jam format event showcases the world’s best urban skiers and riders under the lights of downtown Breckenridge. This event is being held on Friday, December 15th at 6 p.m. The streetstyle course will be open to the public on Saturday and Sunday after Friday’s competition. This year’s three-part Team Challenge course will feature a slopestyle course with a jib section, jump section, and halfpipe section. Each team will have a captain and three athletes: one each for the jib, jump and pipe sections. Burton, Nitro, Salomon, Rome, Ride and DC will all field teams for the Team Challenge, as will ski companies Faction, Armada, Head, Atomic, Volkl and K2. More than 12 hours of the Dew Tour will be broadcast on NBC and NBCSN, while DewTour.com will live stream all event finals Friday through Sunday. All event finals will also broadcast live on Facebook, Periscope, Twitch, Daily Motion, Youtube and the Dew Tour app, including live scoring. All competitions and fan zones — both on and off-mountain in Breckenridge — are free and open to the public. 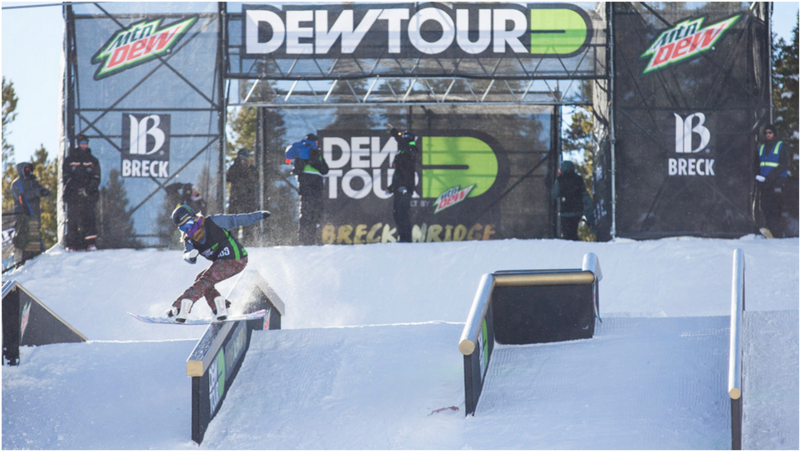 For more information about all the events at the 2017 Breckenridge Dew Tour, click here.